Tucked behind the Austrian capital’s well known Museumsquartier — a complex of art, natural history and cultural museums — is a little side street Christmas market called Spittelberg. No more than a medieval alleyway, gray cobblestones and slightly wobbly Tudor-like white and dark timber buildings, Spittelberg is a place where old Vienna comes to life. In the mellow splendor of muted Christmas glitter, with candlelight lamps in tones of red and wooden market stalls, the Spittelberg Christmas market is about vegetarian cheeses, wild boar sausages, sweet nuts and holiday biscuits. Add a variety of mulled wines and “Weihnachtspunsch” (Christmas punch), there’s enough to tempt any palate. Here the spirit of Christmas comes to life. Less commercial than other markets across the city, Spittelberg’s quirkiness shines through in the homemade exquisite tree ornaments and in the friendly sense of community brought by three generations of vendors. Farther down the narrow street, the resident St. Nicholas wanders among the stalls, wooden staff in hand, bringing good cheer. Invited to a decorated cup of mulled wine to keep away the chill, St. Nicholas hesitates. “It’s too early in the evening,” he says. Wandering from Spittelberg toward the old central market, Naschmarkt, shoppers emerge onto Maria Hilfe Strasse (Our Lady of Mercy Street) — and more Christmas market food, drink and craft stalls. One offers sheep slippers from Transylvania for sale, reminding visitors of Old Testament accounts of winter in Bethlehem. “The most beautiful thing about the Vienna markets is that they are sort of nestled in between these elegant buildings,” says Susie Kelpie, who is from the United Kingdom. Kelpie is one of 3 million annual visitors who attend Vienna’s at least two dozen Christmas markets, which traditionally open the Saturday before Advent. Despite the number of visitors — albeit commercially important to the mainly rural Austrian economy of craftspeople — there is a certain magical quality about Christmas in this largely Catholic European capital. Walking through the elegant sunken streets of the town’s center, known as the Graben, women in fur coats and men in old-fashioned hats and green loden capes mingle under pure white Christmas lights that represent the brightest stars on a winter’s night. Appropriately, the most elaborate Christmas decorations are hung near St. Stephen’s Cathedral. They appear to align with the power of that emanates from the 12th-century church, the heart of the Archdiocese of Vienna. Nearby, at yet another market, Am Hof, a group of young men warm the night with their baritone voices after a couple of glasses of hot wine or punch. “My grandfather used to sing here during Advent,” said Constantin Spallart, one of the singers. Moving outside the center city, Vienna’s Christkindlmarkt (Christ Child Market) on Parliament Square attracts busloads of tourists from Eastern Europe. 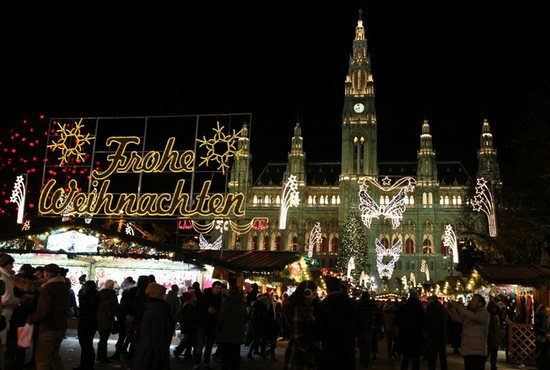 But even there Vienna declines to take part in a commercialized idea of Christmas. A life-size Christmas manger, complete with Christ child and blonde-haired Mary, occupy a prominent part of the market.